The U.S. Department of Commerce’s Economics and Statistics Administration (ESA) today released a new report that profiles U.S. employment in the science, technology, engineering and mathematics (STEM) fields. STEM: Good Jobs Now and for the Future offers an inside look at workers who are driving our nation’s innovation and competitiveness and helping America win the future with new ideas, new companies and new industries. 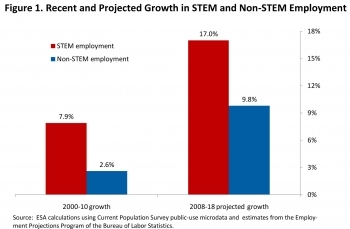 In 2010, 7.6 million people or 5.5 percent of the labor force worked in STEM occupations. 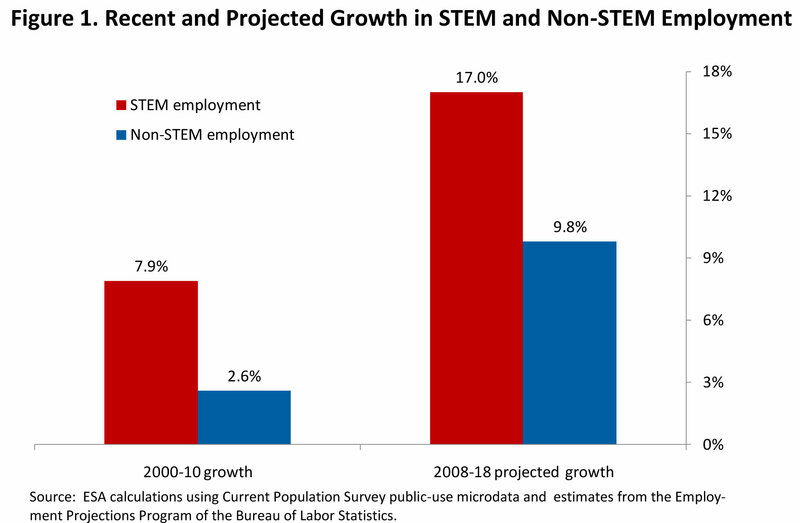 Key findings from the new report show that over the past 10 years, growth in STEM jobs was three times greater than that of non-STEM jobs, and STEM jobs are expected to continue to grow at a faster rate than other jobs in the coming decade. Meanwhile, STEM workers are also less likely to experience joblessness. ESA wrote up their findings on their blog and have released the complete report: STEM: Good Jobs Now and for the Future.